One thing I love about Summer is a bright shiny manicure or pedicure. I just can’t stay away from all the shades of pink and orange and colors inspired by cotton candy and ice pops. Aren’t they so pretty lined up there all nice? 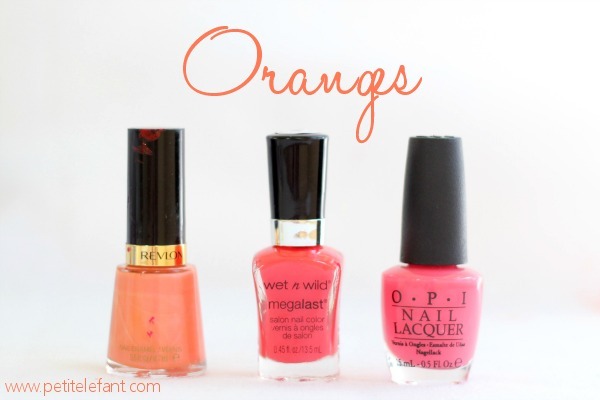 Let’s talk summer nail colors in pastel, pink, and orange. 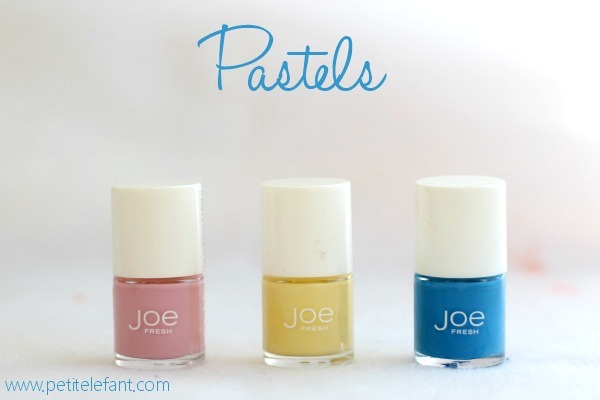 Sometimes it’s fun to rock something out of the ordinary like these colors from Joe Fresh that make me think of summer treats like sherbet and cotton candy. JC Penney carries this line but I couldn’t find them online, you might have to check it out in store. Pastels are fun and very on trend right now, and a fun manicure is an ideal way to play with a trend. I love the color orange. I think Elle was wrong when she said “whoever said orange was the new pink was seriously disturbed!” It’s a beautiful color and a really fun bright for summer. The middle one, from Wet n Wild is about a dollar or so at Target and it lasts forever! Don’t underestimate a bargain brand. The Revlon is a very true orange which probably works all year round. The OPI is a lovely coral shade “Suzy’s Hungry Again” and I’m a little bit in love with it. No discussion of summer nail colors could be complete without pink. Pink is the tried and true, ultra feminine go-to color for Summer. From the cotton candy pastels to the bright electric fuschias, they all work. 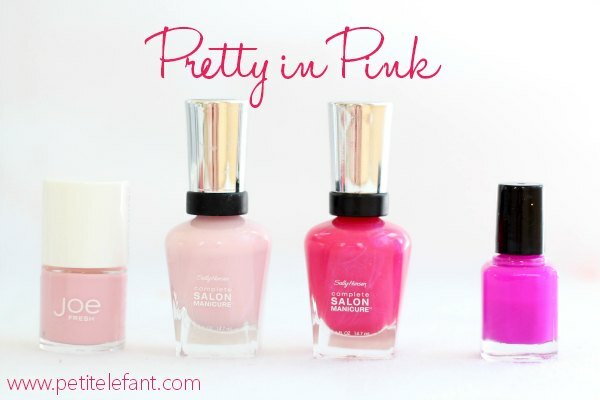 Go a little crazy and do some two-toned pink or ombre pink patterns with your next manicure. Lastly, my favorite top and bottom coats for keeping my Summer nail colors looking good for a long time. The base coat is grow stronger by Essie. It strengthens your nails and gives them a good base all in one. The big shiny top coat by Sally Hansen is a must have. It makes reduces drying time, which I love. I was actually really surprised at how well it works! My nail colors seem to be lasting longer with this duo as well! 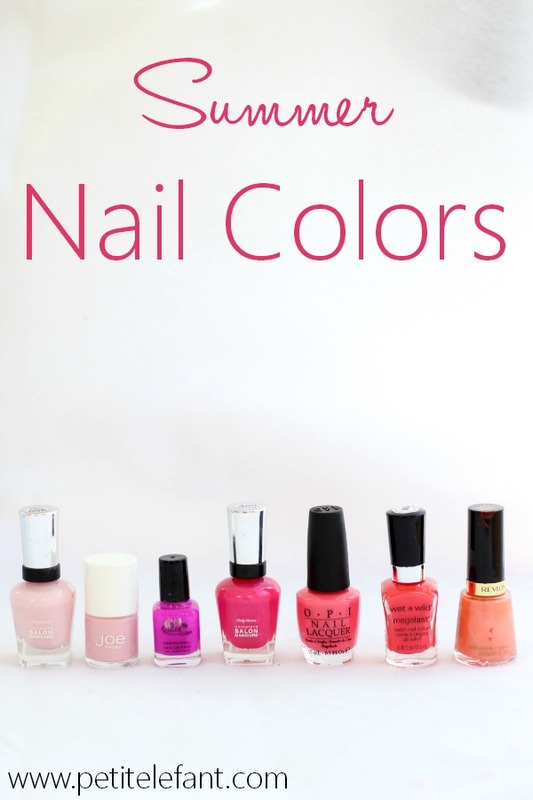 So tell me, what nail colors do you like to rock during the dog days of summer?